Oracle mediator is used to route the message from one destination to another but during integration we do have requirment when we need to call some java code from mediator and we have provision in mediator to call java code using Java Callout. Java Callout is used when we need to have certain valdation or want to manipulate the message. We need to implement the oracle.tip.mediator.common.api.IjavaCallout interface to use below defined function for Java Callout. 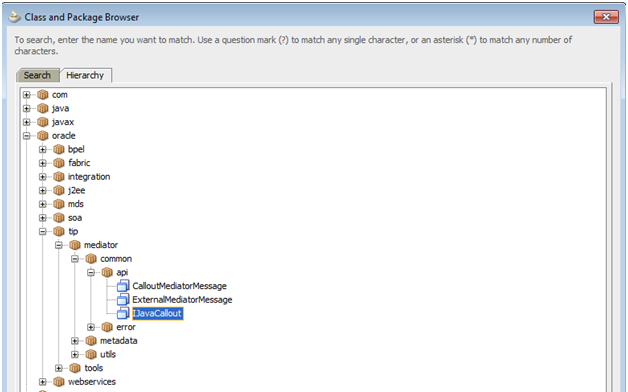 We have below methods in the oracle.tip.mediator.common.api.IjavaCallout interface. · Initialize : This method is invoked when the callout implementation class is instantiated for the first time. · preRouting : This method is called before Mediator starts executing the cases. You can customize this method to include validations and enhancements. · preRoutingRule : This method is called before Mediator starts executing any particular case. You can customize this method to include case-specific validations and enhancements. 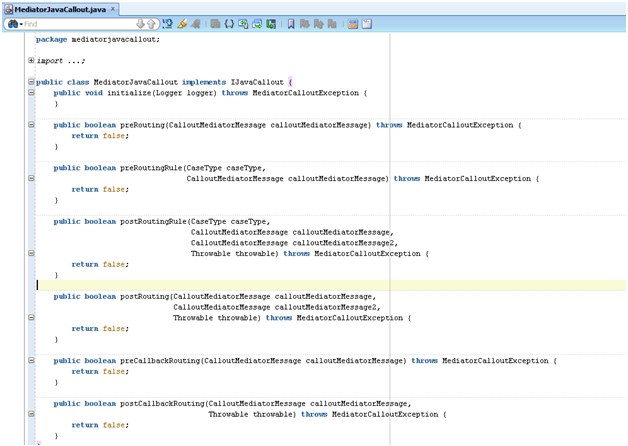 · preCallbackRouting: This method is called before Mediator finishes executing callback handling. 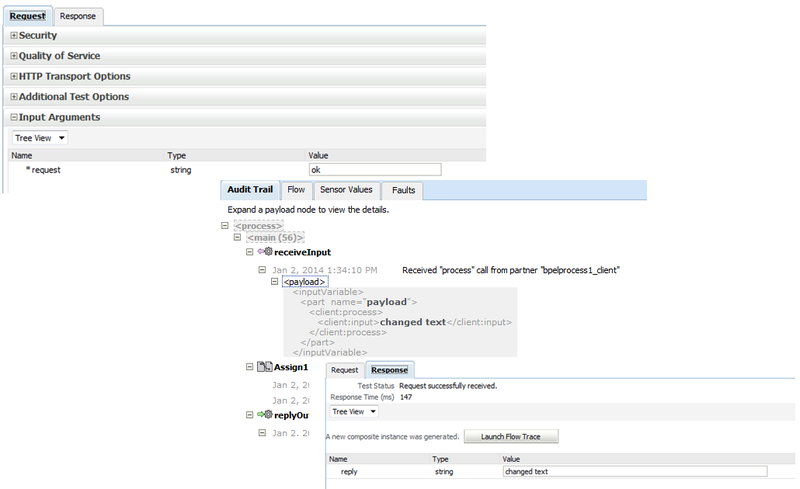 You can customize this method to perform callback auditing and custom fault tracking. · postRouting : This method is called after Mediator finishes executing the cases. You can customize this method to perform response auditing and custom fault tracking. · postRoutingRule: This method is called after Mediator starts executing the cases. You can customize this method to perform response auditing and custom fault tracking. · postCallbackRouting: This method is called after Mediator finishes executing callback handling. You can customize this method to perform callback auditing and custom fault tracking. 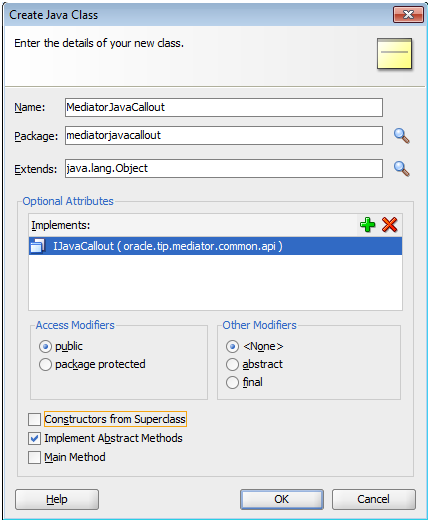 In this post, I will show you how we can use Java Callout functionality inside mediator to change request message. We have prepared one use case, in this use case we call one synchronous service (SOA composite) from mediator and that synchornous service simple assign input message to output message. 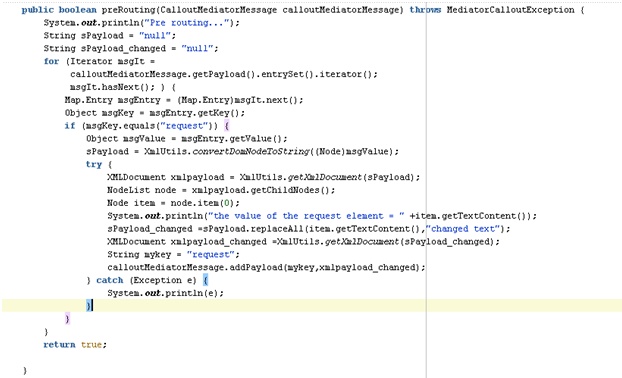 In mediator by using Java Callout we will modify the input message to synchronous service. 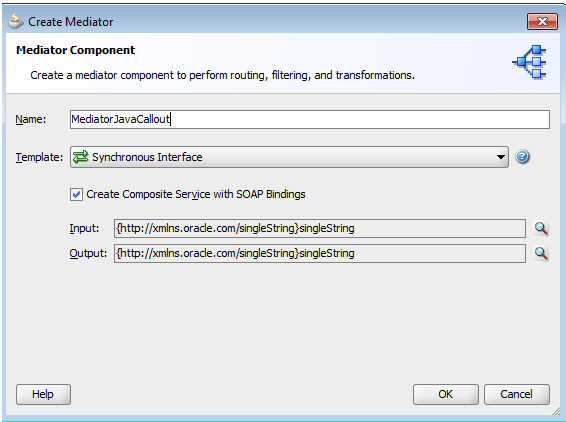 First create a SOA project and add synchronous mediator to it. Once you add the mediator, add synchornous service reference in composite.xml and wire it to mediator. Now open the mediator .mplan file and add necessary mapping to it. we are just mapping input message from Mediator to input message of synchornous service and response message from synchornous service to response message of mediator. Now we will add one java class which implements oracle.tip.mediator.common.api.IjavaCallout interface. To add java class to your project, right click on your project and choose Java Class and add it. Name your java class. As we need to implement oracle.tip.mediator.common.api.IjavaCallout interfce so click on green sign, this will open another pop-up window, from that window choose IJavaCallout from oracleàtipàmediatoràcommonàapi path. Your class should look like below. Once you create this class, you will see all default methods in your class. You can use required method as per your requirement. We will use preRouting method to implement our use case. In this method we will modify the request message that mediator pass to synchronous service. Mykey = “request” or “reply”: This specify for which transaction (Request or Response) we are manipulating the message. As you noticed in this function we are replacing the input message to “changed text”, so whatever value will come in singleString element, this java code replace that with “changed text” and pass it to synchronous service. Below is the sample preRouting method. Now we need to add above generated Java class to mediator. 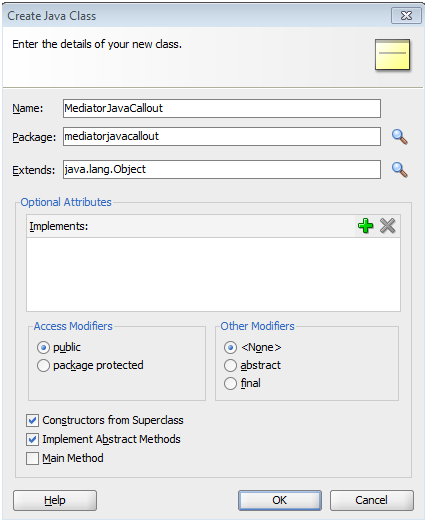 To do that go to mediator .mplan file and click on callout To sign and choose above generated java class. Now deploy your composite and test it.